Since becoming a vegetarian in February and later trying to eat an entirely plant-based diet, I have cooked, prepared, and tried many new foods. Eating a plant-based diet has helped me to become more creative in the kitchen and to avoid making and remaking the same recipes over and over again. One of my latest firsts was making gazpacho. I’ve never made a chilled soup before, let alone eaten one. That is where my new(ish) food processor came in handy. After first tasting my spicy gazpacho creation, I was addicted. I gobbled up the whole bowl and vowed to make more in the near future. The flavor from the jalapeno was slightly spicy, but the cucumber helped balance the heat of the hot pepper. The lime added just the right amount of sweetness to the soup and the spices and garlic kicked it up a notch (as Emeril Lagasse would say). I also enjoyed the added texture of the corn with the smooth soup. Do you have a favorite summer soup? Making gazpacho was a culinary first that paid off. The grilled corn was another foodie first of mine. If you missed the how to and recipe for grilled corn and chili-spiced snap pea salad, you can find it here. “Grilled” corn without the grill. The “grilled” corn was inspired by Shannon’s genius recipe for grilled corn made without a grill, which can be found on her blog Move Eat Create (click here for a link to her how to post and recipe for corn and yellow pepper relish). I followed her cooking instructions, just changed up the spices a little bit. If you have a grill obviously you can just use that! 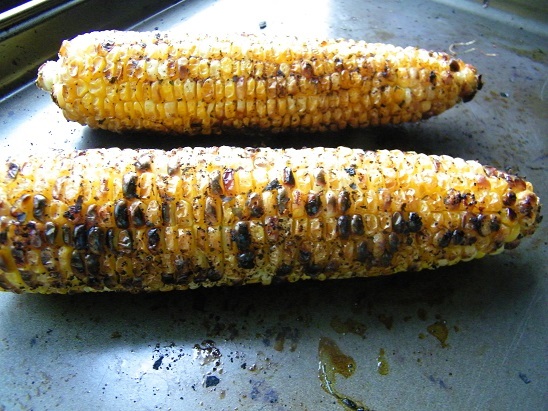 To make the “grilled” corn without a grill, first remove the corn husk and turn the broiler on. Then, gently rinse the corn and pat it dry. Add the olive oil and spices to the corn cob and make sure they are distributed evenly. Put the corn cob on a broiler safe baking pan and put it about 5 inches away from the heat. Let it cook for about 5 minutes and then turn it 1/4 of the way. Do this until all sides of the corn have been “grilled.” Set the corn aside to cool. When it is cool you can slice it off the cob and set it aside until the gazpacho is ready. To make the guacamole, just halve the avocado and dice it small. Add the avocado to a bowl with the other ingredients and mash with a fork. Put it in the refrigerator to let the flavors combine. 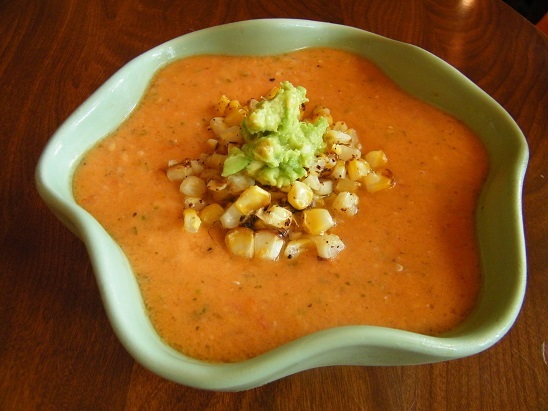 To make the gazpacho, combine all of the ingredients in a food processor. Turn onto the highest speed and process until the mixture is smooth. Add additional spices to taste before serving (if needed). Chill for about 10-2o minutes before serving, if your ingredients were not chilled before adding them to the food processor. When serving, add the gazpacho to a bowl. 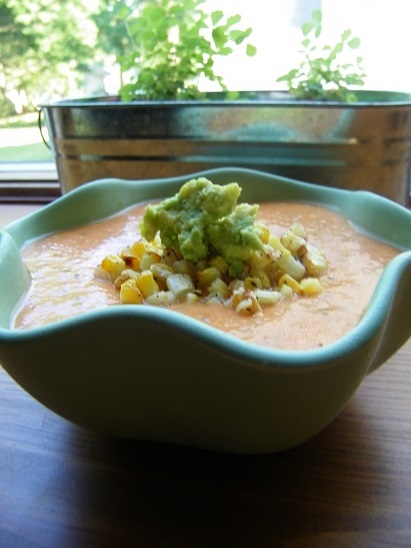 Then top the gazpacho with the grilled corn and top the grilled corn with the guacamole or avocado slices. All three recipes are very simple to make, yet they are still entirely delicious (especially when served together). Enjoy! A glorious & very festive gazpacho soup & you succeeded well, my friend! MMMMMMMMMMMMM! Thank you it is a recipe I will surely make again! Have you made/tried gazpacho? This was my first time.